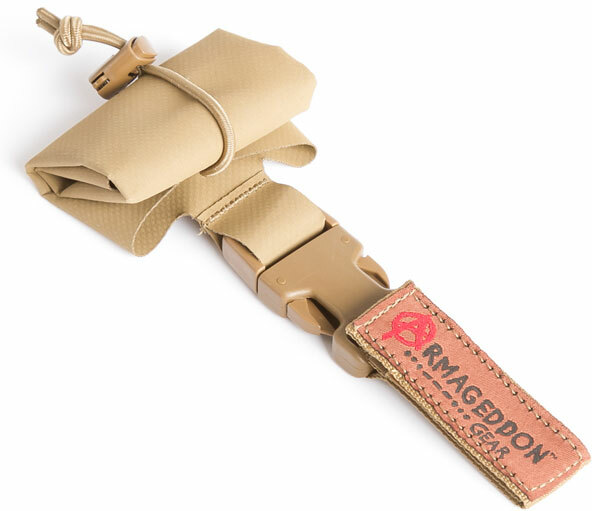 The Armageddon Gear Grippy Thing is a compact portable solution to the problem of having a suppressor stuck on your barrel. Spend a day on the range getting your suppressor hot and dirty and sooner or later it's bound to happen. The suppressor's threads load up with carbon and it won't budge! Enter the "Grippy Thing" to the rescue. The Grippy Thing combines a heavy duty layer of Coyote Brown Hypalon with a quick and convenient velcro-lined attachment strap and adjustable bungee retainer to allow fast access and deployment from your pack, your belt, your gun case or it can even ride along on your rifle sling. Simply let the can cool until you can touch it without burns and wrap the Grippy Thing around your suppressor to create a no-slip surface that allows you to easily remove a stuck can. Like everything Armageddon Gear manufactures, the Grippy Thing is proudly made in the USA!